HIS MOST POWERFUL ENEMY... HIS BROTHER.. A FIGHT TO THE DEATH! Terror and chaos reign in the land of Chungwon. Camellia Blossoms, the most powerful of the warrior gangs, uses this time of unrest to wrestle control of the country form the ailing peoples government while producing counterfeit gold coins to cripple the struggling economy. Within the Camellia Blossoms gang, a group known as "Five Dragons" is being trained to kill in martial arts. Two brothers, Danlyong and Muklyong, belong to the group. But danlyong, with the aid of his elder brother, escapes. In retaliation, the group punishes Muklyong by taking control of his mind and b ody. He will be their "Weapon of Death". Three years on, the innocent townspeople are too afraid to move against the evil Camellia Blossoms. The government has now been overthrown by the most powerful of the gang's martial arts experts, Lord Seobong, and there is no one left to oppose him. Smaller gangs in the countryside continue to flourish, causing death and mayhem in the villages. honglyung, seeking revenge for her father's murder, sets out with her friends to find the only person who can save the country - Red Hawk. But to be victorious, Red Hawk must face and kill Camellia Blossom's most powerful weapon...his own brother! "Red HAWK" is a movie based on the Korean comic book titled "Redhawk" published by Dai Won Publishing which is a pretty cool action movie. It has similarities to "Dragon Ball Z", "Fist of the Northstar" and "Ninja scroll". Talk about trying to break it to her gently! There are several instances where the translation falls down, but overall it is an entertaining story with a good cast of interesting characters and mythos. That's a debate for another time. 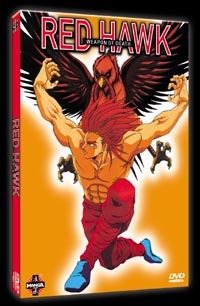 As for "Red Hawk", it features awesome fight scenes with a character with the hair and look of Super Saiyajin 3 of "Dragon Ball Z", the characters which remind me of "Fist of the Northstars" and the challenges of opponenents similar to "Ninja Scroll". As for DVD special features, there is a photo gallery, character bio and the standard Manga Entertainment trailers. Featuring blistering martial arts sequences with extraordinary character designs, Red Hawk is an exciting, action packed animation thriller, which once again is now available for £5 so you might as well add it to your collection.